Caramel apples are all well and good, but I always wanted to try my hand at making a caramel pear. Pears have a totally different shape, texture and flavor profile, which goes very well with a deep, rich, sticky caramel. Add some crunchy pecans and you’re in business! In a medium saucepot with a candy thermometer, combine the sugar, butter, sweetened condensed milk, corn syrup, maple syrup, vanilla, molasses and salt. Stir, and cook over medium-low heat for 14-15 minutes until the temperature reaches 236 degrees. Pour the hot caramel into a bowl and let it sit for about 4-6 minutes until it has cooled to 200 degrees. Now you’re ready to dip! Make sure your pears are firm, but not too under-ripe. If your pears are too ripe, they will spoil too quickly once dipped. Holding a pear by the top near its stem, dip the pear about 2/3 of the way into the caramel. Gently lift it out of the caramel and allow the excess caramel to drip off. Carefully drag the bottom of the dipped pear on the edge of the bowl to get rid of a little more of the excess caramel, and set the dipped pear into a shallow bowl of the chopped pecans. Once the pear’s bottom is coated in pecans, set it on a parchment-lined sheet pan. Continue dipping the pears into the caramel and coating the bottoms in pecans. Once all the pears are dipped, set the pan in the fridge briefly to allow the caramel to set up fully. Before eating, take the pears out of the fridge and let them sit for at least 20-30 minutes so the caramel can soften up. The fridge will set it up quite firmly, and it’ll be way too hard to eat! The simplest way to eat these is to slice them up into quarters and munch away. The caramel has a lot of depth of flavor from the molasses and maple syrup. It pairs wonderfully with the firm, grainy and sweet pears! Try it and tell me you don’t like it as much or more than caramel apples. 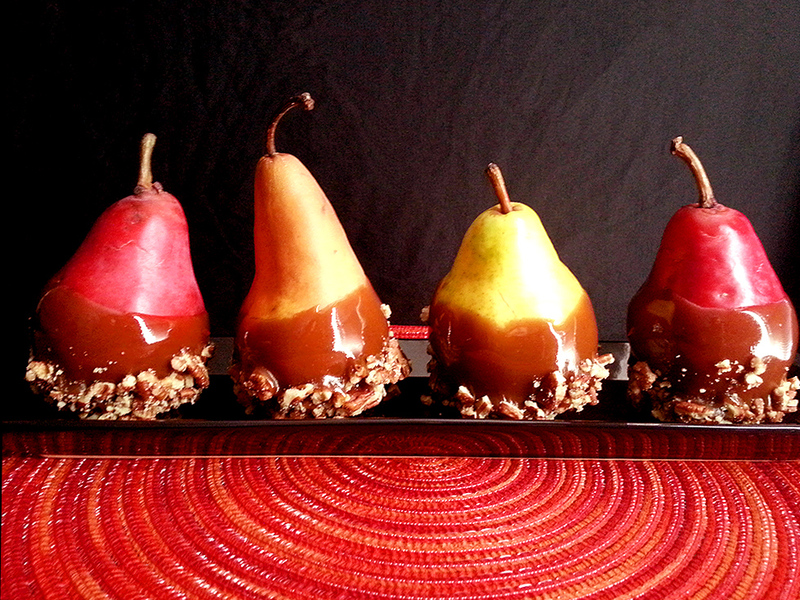 I think these look very elegant and the variety of pears make for a beautiful range of colors, perfect for the season!